Global warming leads to endosymbiotic archaeal growth and generation of new cellular organelle called neurotransminoids. 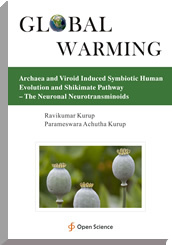 The neurotransminoids have the shikimic acid pathway and can synthesize tryptophan and tyrosine derived dopamine, serotonin, catecholamines, morphine, nicotine and strychinine. These neuroactive compounds generated by neurotransminoids play a role in neuropsychiatric disorders and systemic disease.